This contribution introduces giant radiating dyke swarms to the plume vs. “alternatives” debate. I briefly review characteristics of giant radiating swarms on Earth, Venus and Mars, and discuss constraints on their origins. Giant swarms (≥ 300 km in length) have linear, radiating and arcuate distributions (Halls, 1982; Fahrig, 1987; Ernst et al., 1997; Ernst et al., 2001). 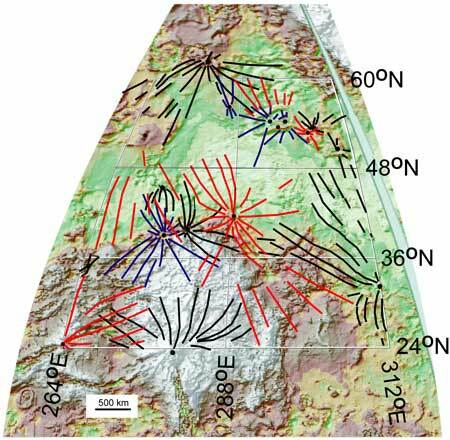 Linear swarms may be related to rifting, and arcuate swarms may reflect regional variation in the stress field during emplacement, or subsequent deformation. I focus herein on radiating swarms. While some radiating swarms have a pattern in which dykes trend along the arms of a triple junction (type 3 radiating swarms; Ernst & Buchan, 1997), I discuss those having a continuous or semi-continuous fan of dykes (types 1 and 2). Some dramatic examples are shown in Figures 1a-d. Giant radiating dyke swarms are interpreted to represent the plumbing system part of large igneous provinces (Ernst & Buchan, 1997). Figure 1a: 1267 Ma Mackenzie radiating swarm, of northern Canada (after Baragar et al., 1996). Dots indicate areas where flow direction was determined. Arcuate line indicates boundary between vertical flow (close to swarm centre) and horizontal flow (at all greater distances). Figure 1b: 200 Ma CAMP radiating swarm (after Ernst & Buchan, 2001). S and V mark areas of sills and volcanics. Note that dyke pattern has been alternatively interpreted as several sets of linear swarms rather than an overall radiating pattern (Hames et al., 2003). (Ed: see also CAMP page). Figure 1c: 2215 Ma Ungava radiating swarm, Superior Province, Canada (after Buchan & Ernst, 2004). Figure 1d: 2500-2450 Ma Matachewan and Mistassini radiating swarms, Superior Province, Canada (after Ernst & Buchan, 2001). Giant radiating dyke swarms are also important on other planets. The surfaces of Venus and Mars are interrupted by extensive systems of long narrow troughs having linear, arcuate and radiating geometries (e.g., Grosfils & Head, 1994; Mege & Masson, 1996; Ernst et al,. 2001; Wilson & Head, 2002; Ernst et al., 2003). Some of these graben-fissure systems have a purely tectonic (extensional) origin. However others, particularly the large radiating systems, are interpreted as radiating dyke swarms. Specifically, the individual grabens are interpreted to represent surface deformation above underlying dykes. Giant radiating swarms are particularly abundant on Venus (e.g., Figure 2) and commonly show continuous patterns spanning an angular arc of > 270°. Since Venus lacks plate tectonics, these patterns are primary. This contrasts with Earth where plate tectonic processes are expected to have dismembered radiating swarms. Figure 2: Giant radiating graben-fissure systems in the Guinevere Planitia/Beta Regio region of Venus. Topography is shown in the background (after Ernst et al., 2003). Lateral emplacement is important in the genesis of many radiating dyke swarms. This has been most clearly demonstrated for the Mackenzie radiating swarm (Figure 1a), where magnetic fabric data indicate vertical flow within 500 km of the centre, but horizontal (lateral) flow out to distances of 2,300 km (Ernst & Baragar, 1992). On Venus and Mars, the continuity of individual grabens over distances of hundreds of kilometres implies lateral dyke emplacement. Theoretical arguments in support of long-distance lateral flow in dykes are well developed (e.g., Rubin, 1995). Injection outward from a centrally-located overpressurized reservoir or reservoirs. This interpretation has been applied to the 3,000-4,000 long radiating swarms of the Tharsis region of Mars (Wilson & Head, 2002), and has also been explored for swarms on Venus (McKenzie et al., 1992). Although this process does not require central uplift it does require a centrally-located magma source, capable of voluminous magma production. Any associated domal uplift will cause radial fracturing that will further enforce the radiating geometry of the dyke swarm (e.g., Ernst et al., 2001). Dykes can continue to propagate beyond the edge of uplift, because of continued magma availability, but dyke trend beyond the uplift is controlled by regional (e.g., plate-boundary) stresses. In such cases the swarm may transition from a radiating to a sub-linear geometry. For instance, in the Mackenzie swarm this transition occurred at about 1,000 km radius. A variant of this model focuses on gravity sliding off the uplift to generate the extension (Sengor, 2001; Mege & Ernst, 2001). Radiating swarm geometry and evidence for a centrally located magma source are compatible with mantle plume or mantle diapir models. It is unclear how giant radiating swarms can be generated by non-plume models. Specifically, models of lithospheric fracturing, or “EDGE” convection. (Ed: See also EDGE convection page). should generate linear belt-like magmatism not the “point-like” sources required for giant radiating swarms. (Ed: See also “Giant factors” by Don Anderson, and “Giant features” by Yuri Fialko). The number of known giant radiating swarms on Earth is small, only about 25 (Ernst & Buchan, 1997), and represents a small proportion of the current inventory of 154 giant swarms (Ernst et al., 1996; Buchan & Ernst, 2004). However, the primary geometry of most giant swarms is poorly known since plate tectonics must fragment them. Until more sub-linear swarms have been precisely dated and reconstructed using paleomagnetism, the true number of giant radiating swarms on Earth will remain unknown. Venus is of similar size to the Earth but lacks plate tectonics. Its inventory of giant radiating dyke swarms is probably in the hundreds (Grosfils & Head, 1994; Ernst et al., 2003). Baragar, W.R.A., Ernst, R.E., Hulbert, L., Peterson, T. (1996). Longitudinal petrochemical variations in the Mackenzie dyke swarm, northwestern Canadian Shield. J. Petrol. 37: 317-359. Buchan, K.L., Ernst, R.E. (2004) Diabase dyke swarms and related units of Canada and adjacent regions. Geological Survey of Canada Map 2022A, scale 1:5,000,000 with accompanying catalogue. Ernst, R.E., Baragar, W.R.A. (1992) Evidence from magnetic fabric for the flow pattern of magma in the Mackenzie giant radiating dyke swarm. Nature, 356: 511-513. Ernst R.E., Buchan K.L. (1997) Giant radiating dyke swarms: their use in identifying pre-Mesozoic large igneous provinces and mantle plumes. In: Mahoney J., Coffin M. (Eds.) Large Igneous Provinces: Continental, Oceanic, and Planetary Volcanism, AGU Geophys. Monogr. Ser. 100, pp. 297-333. Ernst, R.E., Buchan, K.L. (2001) The use of mafic dike swarms in identifying and locating mantle plumes. In: Ernst, R.E., Buchan. K.L. (Eds. ), Mantle Plumes: Their Identification Through Time. Geol. Soc. America Spec. Paper 352, pp. 247-265. Ernst, R.E., Buchan, K.L, West, T.D, Palmer, H.C. (1996) Diabase (dolerite) dyke swarms of the world: first edition. Geological Survey of Canada Open File 3241. Ernst, R.E., Grosfils, E.B., Mege, D. (2001) Giant Dike Swarms: Earth, Venus and Mars. Ann. Rev. Earth Planet. Sci., 29, 489-534. Ernst, R.E., Desnoyers, D.W., Head, J.W., and Grosfils, E.B. (2003) Graben-fissure systems in Guinevere Planitia and Beta Regio (264-312°E, 24-60°N), Venus, and implications for regional stratigraphy and mantle plumes. Icarus 164: 282-316. Fahrig, W.F. (1987) The tectonic setting of continental mafic dyke swarms: failed arm and early passive margin. In: Halls, H.C., and Fahrig, W.F. (eds.) Mafic Dyke Swarms. Geological Association of Canada Special Paper 34, p. 331-348. Grosfils, E.B., Head, J.W. (1994) The global distribution of giant radiating dike swarms on Venus: implications for the global stress state. Geophys. Res. Lett. 21, 701-704. Halls, H.C. (1982) The importance and potential of mafic dyke swarms in studies of geodynamic processes. Geoscience Canada, 9: 145-154..
Hames, W.E., McHone, J.G., Renne, P.R., Ruppel, C. (Eds.) (2003) The Central Atlantic Magmatic Province: insights from fragments of Pangea. American Geophysical Union, Geophysical Monograph 136, 267 p.
McKenzie, D., McKenzie, J.M., and Saunders, R.S. (1992) Dike emplacement on Venus and on Earth. J. Geophys. Res. 97: 15,977-15,990. Mege, D., Masson, P. (1996) A plume tectonics model for the Tharsis province, Mars. Planetary and Space Science 44: 1499-1546. Mege, D., Ernst, R.E. (2001). Contractional effects of mantle plumes on Earth, Mars and Venus. In: Ernst, R.E., Buchan. K.L. (Eds. ), Mantle Plumes: Their Identification Through Time. Geol. Soc. America Spec. Paper 352, pp. 103-140. Rubin, A.M. (1995) Propagation of magma-filled cracks. Annu. Rev. Planet. Sci. 23: 287-336. Sengor, A.M.C. (2001) Elevation as indicator of mantle-plume activity. In: Ernst, R.E. and Buchan, K.L. (Eds. ), Mantle Plumes: Their Identification Through Time. Geol. Soc. America Spec. Paper 352, pp. 183-225. Wilson L., Head J.W. (2002) Tharsis-radial graben systems as the surface manifestation of plume-related dike intrusion complexes: models and implications. J. Geophys. Res. 107 (E8): 1-1-1-24, DOI 10.1029/2001JE001593.